Snapshot of Honduras – The official language of Honduras is Spanish. Most of Honduras’ population shares both European and Native American ancestry. Most Hondurans are Christian, with the Roman Catholic church being the largest church in the country. However, various Protestant and Evangelical denominations have been increasing in popularity in recent years. Legends and folklore are rather prevalent in Honduras. Holidays and other celebrations are marked by music and dancing, and during the Holy Week processions are held commemorating the events of Easter. Colored sawdust is often used to decorate the pathway of the processions. Salsa, merengue, reggaeton, and American music are popular in Honduras, though Mexican rancheras music is also popular in more rural areas. Soccer is Honduras’ most popular sport. Tortillas are used in most Honduran meals and in a variety of dishes. Fried fish, carne asada, and tamales are all typical menu items in different regions of the country. Red bean soup and rice and beans are also common. Coconut is frequently used in recipes, and many tropical fruits, such as papaya, pineapple, and passion fruit are regularly eaten as well. There are 6 stakes and districts located within the Honduras San Pedro Sula East Mission. The Church’s growth in the area led to the mission being split in 2013 to form the neighboring Honduras San Pedro Sula West Mission. The area is served by Honduras’ only temple, which is located in Tegucigalpa. Honduran cuisine combines elements of Spanish and indigenous culture. Food staples include tortillas, rice and beans, and soup. Conch (caracol) soup and red bean soup are popular types of soup. Seafood (especially fresh fish) is commonly incorporated in dishes in the coastal region. Many types of tropical fruit are also widely available, such as mango, banana, passion fruit, and soursop. 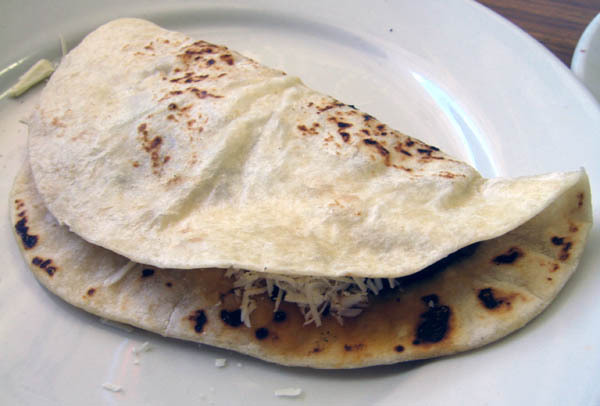 Baleadas are a popular street food. Baleadas are similar to burritos. They consist of a thick wheat flour tortilla filled with mashed fried beans and cheese, sometimes incorporating other ingredients such as eggs or sausage. A baleada. Photo cca-sa3.0u by Ipaz0185 at Wikimedia Commons. Missionaries serving in Honduras get around either by walking or by using public transportation. Within San Pedro Sula, there are many public transportation options available, including buses, minivans (called rapiditos), and taxis (called colectivos). Rapiditos are the fastest form of transportation. A rapidito minivan in San Pedro Sula. The city of San Pedro Sula is notorious for its gang activity. Weapons and drug trafficking are serious problems, as is homicide. Stay away from dangerous neighborhoods that have gang activity, especially at night. Ask local members or your mission president about places within your area that you should avoid. They’ll know the best routes to take. One of the region’s biggest cultural events is the Gran Carnaval Internacional de La Ceiba. This event celebrates Saint Isidore, the patron saint of the city of La Ceiba, and is held every year on third or fourth Saturday in May. There is a large parade followed by other festivities on the main street, while individual neighborhoods within the city have smaller carnivals during the week leading up to the parade. The city of Yoro is famous for its Lluvia de Peces (rain of fish), which is celebrated with a carnival each year in June or July. Local tradition states that a rain of fish has occurred in the area for over a century. When learning Spanish, you’ll be taught the “usted” and “tu” forms. In Honduras, they often speak in another tense–“vos,” which is very casual slang. You will probably not/should not speak in “vos” as a missionary, but if you don’t know what it is, you can get easily confused. Each region has its own way of speaking, but you will catch on quickly. Bring a lightweight, waterproof jacket for the rainier months. Comfortable and waterproof walking shoes are also especially useful, along with thick socks to prevent blisters. Don’t even bother bringing long-sleeved shirts. You will probably never use them. Take comfortable, light pants that breathe, because you will be hot and sweaty. Pulperias are a missionary’s best friend. They’re like small convenience stores that can be found in every neighborhood, sometimes on each street, and oftentimes more than one per street. They sell basic commodities like food and hygiene products. Missionaries often have lots of digestive problems or stomach sicknesses after arriving and having to adjust to the food. However, these sicknesses are not serious and soon pass. Another health issue is Dengue Fever. Occasionally, a missionary will get dengue, which is more serious but very treatable. The best way to prevent it is to use insect repellent. In most areas, there will be members who will do your laundry for a small fee. Each house has its own wash basin if you prefer to wash your clothes by hand. Missionary apartments are generally pretty nice. However, it is important to understand that living conditions in Honduras are not as good as in the States. You won’t have carpet; all floors are ceramic or cement. You will have a fan instead of air conditioning most likely. There are many great sights within the San Pedro Sula East mission area. There are LDS congregations located on the Bay Islands, which are famous for their beautiful beaches and exotic marine wildlife. English is the primary language spoken on these islands. Pico Pijol and Pico Bonito National Parks are also located within mission boundaries. Shipping: Recommended shipping through USPS. Other companies, such as DHL, UPS, and FedEx all arrive with much larger tariff’s to be paid to the company to claim the packages at the mission, sometimes as much as $150. Packages from these companies also they take much longer and get stuck in Honduras in customs more frequently. You can use USPS Priority Mail – but it’s not really necessary. Parcel post arrives almost as quickly. Tracking does not help once the package reaches Honduras and actually slows down the process. Truly, the fastest, least expensive packages to arrive are those without tracking through USPS. Keep in mind that the best advice is not to send anything valuable. Expect packages to take 4-8 weeks to arrive. West End, on the island of Roatán. Photo cca-sa3.0u by Westbrowncanada at Wikimedia Commons. 12 Calle, Avenida Circunvalacion, S. O. Climate: San Pedro Sula has a tropical savanna climate. Temperatures reach between the 80s and 90s Fahrenheit year-round. Rain is also common throughout the year, though January through May are somewhat drier. Did you serve in the Honduras San Pedro Sula East Mission? If so we want to hear from you! Contact us at editor@missionhome.com and share your unique experiences!